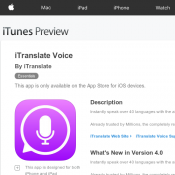 iOS App 'iTranslate Voice' for Free. Instantly speak over 40 languages with the all-new iTranslate Voice! Already trusted by Millions, the completely re-designed iTranslate Voice guarantees a flawless voice translation experience in over 40 languages. With more than 250 predefined phrases, our new Phrasebook is designed to help out in any situation. Our Transcripts feature allows you to export or share your conversation within seconds.